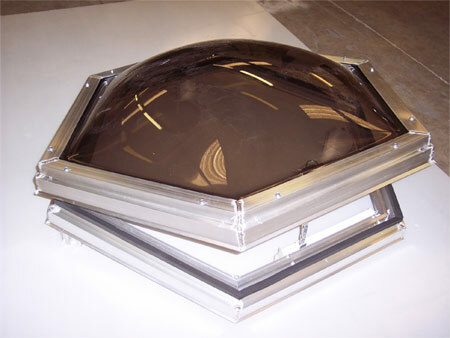 Specifications: Clustered skylights as manufactured by Advanced Skylights Inc. consist of two or more standard sized skylights combined to form one unit. These units consist of base frame members and mullions of 6063 T-5 extruded aluminum alloy, with condensation gutters to ensure adequate drainage to exterior. Glazing shall consist of 1/8” 3/16” or 1/4” high impact cast acrylic domes. These units are available in single-dome, double-dome, or triple-dome configurations. These domes are to be sealed using Norcryl clear acrylic glazing seals. Retainer caps shall consist of 6063 T-5 extruded aluminum alloy. All fasteners shall be corrosion resistant # 10 tech screws with neoprene gasket washers. All units are available in Clear, # 2447 White, # 2412 Bronze, or # 6047 Grey acrylic domes. All units are available with powder coated frames and retainers in a wide range of colors and textures. Clustered skylights are available in curb mount configuration only and require intermediate supports under mullion rails. Specifications: Skylights shall be factory assembled as manufactured by Advanced Skylight Systems Inc. Operable skylights are designed to be utilized in rooms where extra ventilation is desired. These units shall consist of an extruded aluminum 6063 T- 5 alloy base frame with a condensation gutter to ensure adequate drainage to exterior. Corners will be heliarc welded. Glazing shall consist of 1/8” 3/16” or 1/4″ high impact cast acrylic domes. These domes are to be sealed using Norcryl clear acrylic glazing seals. These units are available in single-dome, double-dome or triple-dome configurations. Retainer frames shall consist of 6063 T-5 extruded aluminum alloy with heliarc welded corners. All fasteners shall be # 10 corrosion resistant tech screws. These units incorporate corrosion resistant chain drive operating mechanisms. A pivot pin hinge system and a removable insect screen. These units are also available with electrical, remote control operating devices. All units are available with Clear, #2447 White, # 2412 Bronze, or # 2064 Grey domes. 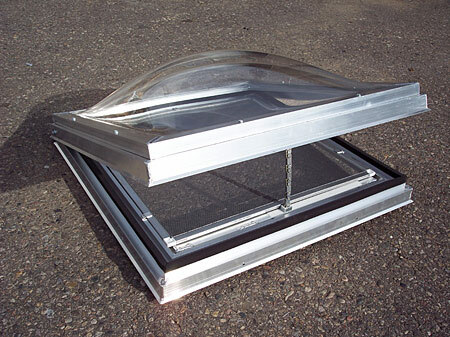 Operable skylights are available in curb mount and self flashing configurations. All units are available with powder coated frames in a wide variety of colors and textures. Specifications: Skylights shall be factory assembled as manufactured by Advanced Skylight Systems Inc. Aesthetically pleasing, pyramids create interesting lighting effects enhancing the appearance of any project. These units shall consist of an extruded aluminum 6063 T-5 alloy base frame with a condensation gutter to ensure adequate drainage to exterior. Corners will be heliarc welded. Glazing shall consist of 1/8” 3/16” or 1/4” high impact cast acrylic lenses. These lenses are to be sealed using Norcryl clear acrylic glazing seals. These units are available in single-lens and double-lens configurations. Pyramid lenses incorporate a 30 degree pitch. Retainer frames shall consist of 6063 T-5 extruded aluminum alloy with heliarc welded corners. All fasteners shall be # 10 corrosion resistant tech screws. All units are available with Clear, # 2447 White, # 2412 Bronze or # 2064 Grey lenses. 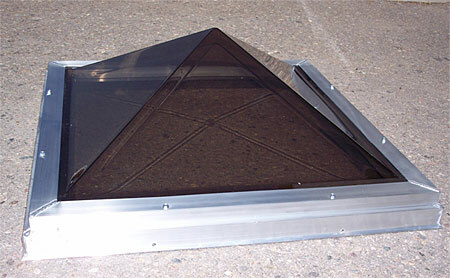 Pyramidal skylights are available in curb mount or self flashing configurations in square dimensions only. All units are available with powder coated frames in a wide variety of colors and textures. Specifications: Skylight shall be factory assembled as manufactured by Advanced Skylight Systems Inc. These units shall consist of an extruded aluminum 6063 T-5 alloy base frame with a condensation gutter to ensure adequate drainage to exterior. Corners will be heliarc welded. Glazing shall consist of 1/8” 3/16” or 1/4″ high impact cast acrylic domes. These domes are to be sealed using Norcryl clear acrylic glazing seals. 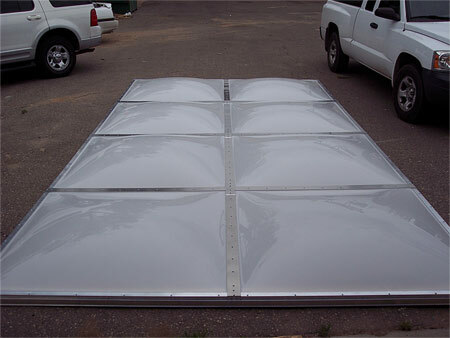 These units are available in single-dome, double-dome, or triple-dome configurations. Retainer frames shall consist of 6063 T-5 extruded aluminum alloy with heliarc welded corners. All fasteners shall be # 10 corrosion resistant tech screws. All units are available with Clear, # 2447 White, # 2412 Bronze or # 2064 Grey domes. These units are available in shapes such as Octagons, Hexagons, Triangles, Trapezoids, Pentagons and Polygons. These units are available in curb mount or self flashing configurations. All units are available with powder coated frames in a wide variety of colors and textures. Phone: 505.343.1433 ⋅ © 2008-2012 Skylight Star. All Rights Reserved. Albuquerque Web Design and Hosting by MIS, Inc.